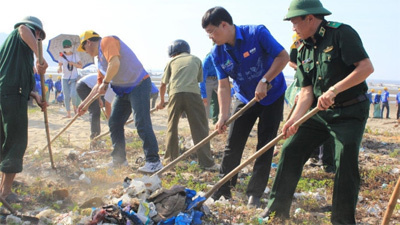 The Ho Chi Minh Communist Youth Union (HCMCYU) and Vietnam Television (VTV) organised a ceremony on June 19 at Sam Son beach in central Thanh Hoa province to launch a campaign to clean sea and beach areas nationwide. The campaign will be implemented from June 2016 to June 2019. It was piloted in four central coastal provinces of Ha Tinh, Quang Binh, Quang Tri and Thua Thien-Hue, and produced positive results. First Secretary of the HCMCYU Central Committee Le Quoc Phong said that the campaign aims to raise public awareness of cleaning the sea and preserving the maritime environment. In response to the launching ceremony, around 28,000 young people, volunteer students and soldiers in 28 coastal provinces and cities participated in collecting garbage on beaches. A music festival was also held on Sam Son beach to call on the community to join hands to clean the sea./.